If you wish you could whisk someone off to a small pub and enjoy a few drinks together, it's time to send them a basket of flavorful brew with a side of salty snacks. This was a first time gift order for me. I was very pleased with this company. They kept me informed of the product's progress and the delivery time was spot on correct. (Even tho it had to be sent to a little town in the middle of Washington.) My daughter sent a picture of it ... looked good, and my son-in-law was surprised to finally get a gift he really liked! I have to say that after I ordered a bunch of the beer gift baskets for my sales team this year as Christmas gifts. I was blown away by the response each of them gave me when they received them. They all loved it and was so happy they enjoyed them! I will be ordering again next year for sure! Thanks for a great gift idea! It was a big hit with the person I sent this to!! She was recovering from kidney stones & her doctor told her that beer would help. The only complaint is I left special instructions top call first ( which they did not do) but luckily they were home!! Will use this again. Your service is great! The basket was received three days after I ordered it. I've always received good words about the gifts and actually one friend asked if I would send another one for his next birthday! Thanks for all your good service! I ordered this as a sympathy gift for a beer lover who lost his grandmother. He loved it! And I love that I was able to send something other than flowers or fruit. I did not get to see the gift, but the recipient said it was great! I'm so impressed how quickly the basket was delivered! So appreciate being able to check delivery status and ensure the gift basket was received. I only wish I could have it delivered on a specific date, like flowers. I ordered this for my brothers birthday who lives in another state. Since i couldnt celebrate in person i wanted to send something he would enjoy. He said the gift was awesome and sent me a picture. Great gift! My husband was very happy with the microbrew times basket. Our 2 boxer puppies gave this to him for Father's Day. He loved the 3 different microbrews. All were very good. Definitely would recommend this gift. Had this Microbrew Times Gift Basket sent to my brother in Brooklyn as a birthday present. He was very happy with the basket and it arrived in perfect condition..I would recommend using Beergifts.com again. I was surprisingly pleased with the complete experience. It was reasonably priced, fast and simple. And the best part about it was the delivery, it arrived early. My co-worker loved getting the basket with the three beers and snacks. I didn't see the basket as he works in a different state, but he really like receiving it as a thank-you gift. My brother was very pleased with the beer basket. I live in CT, he in FL. The gift was received right on time and in good condition. Great gift for buying "something different." My husband loved the idea of the variety of micro brews in the basket along with the clever snacks. Packaging was very nice. 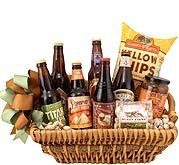 Purchased this gift basket for a nephew's birthday who enjoys trying new craft beers. He was very happy with the beer selection and the snacks included. 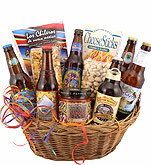 Sent a Birthday Gift Basket to a friend, they said it was a great gift and they loved the Beer and basket. Would definitely use them again. My brother is so hard to buy for, he loved this beer basket we sent him for his birthday! I will definitely be using beergifts.com again. Placed the order and it was delivered promptly. My friend was blown away. And the gift basket was affordable. What's not to love?? I was very satisfied with my recent purchase. In the future, I would definitely use this company again. I ordered this basket for my father's birthday. He loved it! It was shipped directly to his home in FL. GREAT GIFT ideas! Order was shipped and received as promised. I'll definitely use thus company again.